Check out what's happening in 2011 at "The Patch." Lots of new features and fun. Visit forum as well for day to day updates! As of 2016 Recrational Prospecting is Closed. Our Campground is still operational year round. But because of our Spring hours, we'd also need a 3 day advance notice to serve you properly. Call 72 hours in advance for Reservations! RV's, camping and cabin rentals open 7 days a week but call first. For groups call ahead 72 hours in advance. For long term lot rental, give us a call 704-463-5797! We gladly except the following credit cards for purchases of $25 and over. 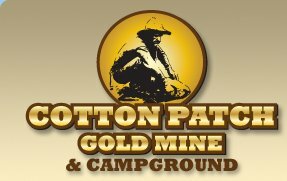 This site is Copyright 2016, Cotton Patch Gold Mine and Campground. All rights reserved.